One of the most important dates in the entire EU referendum campaign will be the 7th June: the deadline for registering to vote. The introduction of Individual Voter Registration in the last parliament means that every eligible adult must register to vote individually, and can no longer be registered by university halls or the head of the household. The Electoral Reform Society points out that while this is a welcome change for minimising electoral fraud, a serious downside is that many people who have the right to vote have failed to register under the new system. Some estimates suggest that as many as one million eligible voters dropped off the register prior to the 2015 general election, and more could follow. An even greater concern is highlighted by the Electoral Commission, which has shown that those at particularly high risk of not being on the electoral register are young people (especially students) living in rented accommodation. The 2015 British Election Study, for example, shows that 87% of 18-24 year olds were registered to vote before the last election, compared with 98% of the over-25s. The implications of unequal voter registration for the EU referendum are, on one level, obvious. As this research has repeatedly demonstrated, the under-25s are by far the most pro-EU group and consequently far more likely to vote to stay in the EU on 23rd June. The Remain campaign is heavily dependent upon the votes of the under-25s to offset the advantage enjoyed by the Leave campaign among older voters (especially those over 65), meaning that Remain will have to devote considerable resources to not only making sure the (relative to their elders) vote-shy young people actually vote in the referendum, but to making sure that they are registered to vote in the first place. 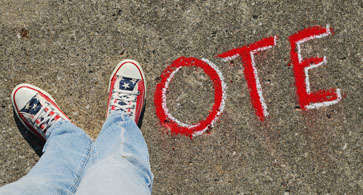 There is, however, an often overlooked additional consequence to being registered to vote which is also extremely important when considering how the turnout of young people in the referendum (or any election) can be increased: the fact that people who are not registered to vote are far less likely to be contacted and mobilised by political parties and campaigners. This matters because the local campaigning efforts of political campaigners, whether in the form of leaflets, mail-drops, telephone calls or door-knocking (though the latter is by far the most influential) are important sources of information about the election and issues at hand and of the stimuli to actually engage with the contest in the first place. One of the most important drivers of turnout in elections is actually being asked by somebody to vote: the more people campaigners speak to in their constituency the higher the turnout will be. The more young people the Remain and Leave campaigns speak to and contact ahead of the referendum, therefore, the more young people will actually turn up and vote on 23rd June. Being registered to vote is important for receiving information and encouragement to participate from campaigners because of the strategies political parties employ during election (and referenda) campaigns. They in essence employ a two stage process to their local campaigning ahead of a poll. In the year or so before, they focus on ‘blanket’ canvassing – delivering leaflets and letters and speaking to as many people in an area as possible to identify potential supporters. As polling day approaches, they switch to a more targeted approach, focussing their efforts on likely potential supporters i.e., those who are likely to support them in the election, and importantly, those who are likely to actually vote, of which being registered is clearly an important prerequisite. People who meet these criteria find themselves the recipients of targeted mail-shots, telephone calls and doorstep canvassing from campaigners and candidates, with all of the information and encouragement that entails. Those who are registered to vote in the EU referendum by 7th June deadline, therefore, are the most likely to receive campaigning material, phone calls and visits ahead of polling day, and so will have access to more information and support in actually casting a ballot. For young people, whom research has shown are less likely to vote than their elders because of their limited interest in and (to a lesser extent) knowledge of the issues at stake, these campaigning stimuli to participate will be extremely important. This point can be illustrated using British Election Study data. In the 2015 general election, those who were registered to vote had a 79% chance of receiving contact of some sort from a political party; those who were not registered had only a 58% chance. The effect for 18-24 year olds was even more substantial: under-25 year olds registered to vote had a 75% likelihood of being contacted by a party, compared with just 34% for those not registered. Subsequently, people who were contacted in some way had an 82% chance of voting in the election, compared with a 76% chance for those who were not contacted. In other words, being on the electoral register provided a 21% boost to the chances of a potential voter being contacted and mobilised by a political party – and a huge 41% boost for the under-25s – and being contacted in turn provided a 6% boost to the chance of them actually voting because of the information and encouragement that contact provided. The importance of getting young people registered to vote by 7th of June is, therefore, more important than is often suggested. It is not just the capacity of young people to actually have their say in the referendum that is at stake, but the likelihood of them having the motivation to do so and the information so that they feel they can cast an informed vote as well. In light of the limited success both the Remain and Leave campaigns are having in persuading voters to support their positions in the referendum, getting (especially young) people registered to vote could be the most important priority for both camps of the entire referendum campaign. These probabilities were calculated using logit regression analysis on the likelihood of being contacted while controlling for being registered to vote, as well as important demographic traits including tenure, age, gender, ethnicity, education and household income.